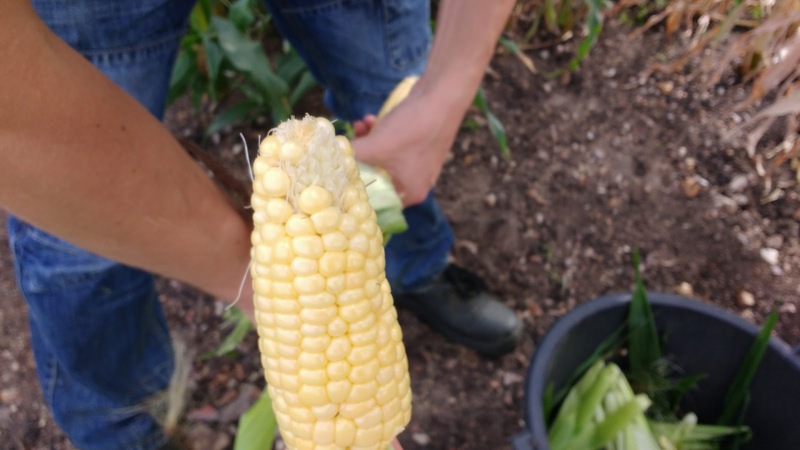 It's been a strange time over at the allotment for the last couple of weeks; instead of a plot brimming with life, it's gradually emptying at a rate which is gathering pace. The onions have all been taken away now for drying so a big empty square has appeared there. 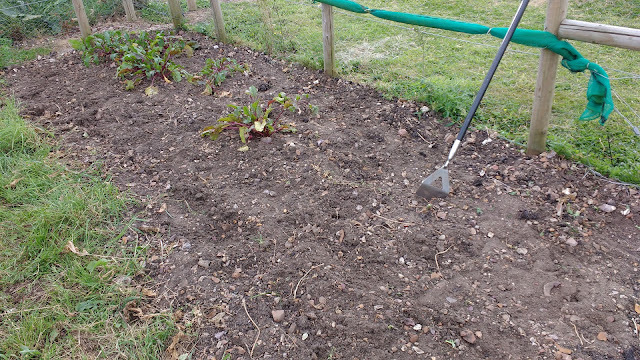 The last remaining turnips have been removed so with just a few beetroot on the front to go before that big space opens up. We're lucky to be able to make use of the communal burny bin so at the weekend we burned the broad bean stalks which worked really well. And a bit of straw. 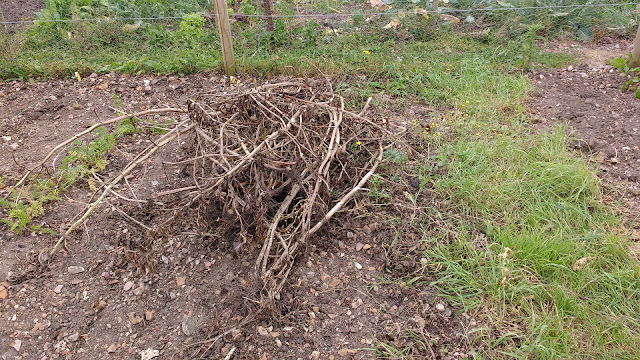 Ideally, we may be able to burn more waste rather than attempting to 'compost' aka piling it in a big heap which never turns into anything remotely composty. I finally got round to buying a trug each and surprised C with the large parcel last week. They are the BEST buy I've made in ages and C was thrilled with his, especially as it had his name on it. I'm in his good books! They are handmade to order from Loldean Timber right here in Norfolk, very sturdy and will last us forever. I'm so impressed! C's is in colour Willow with text in white, mine is in Coastal Mist with my name in black. 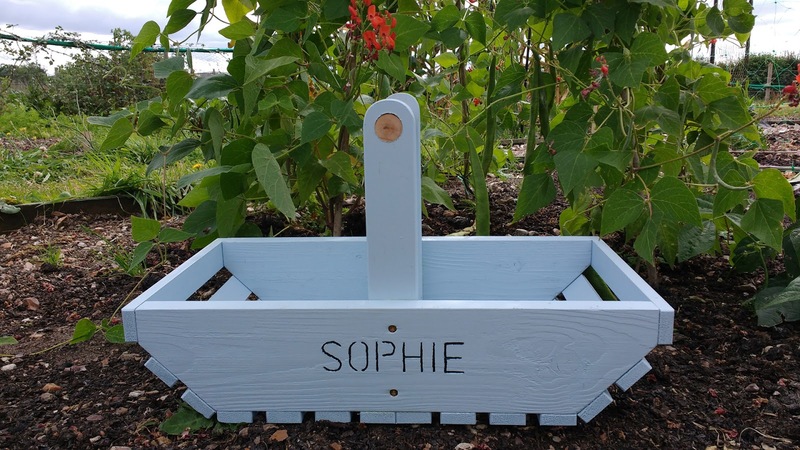 They were £21 each including delivery and that includes personalisation. 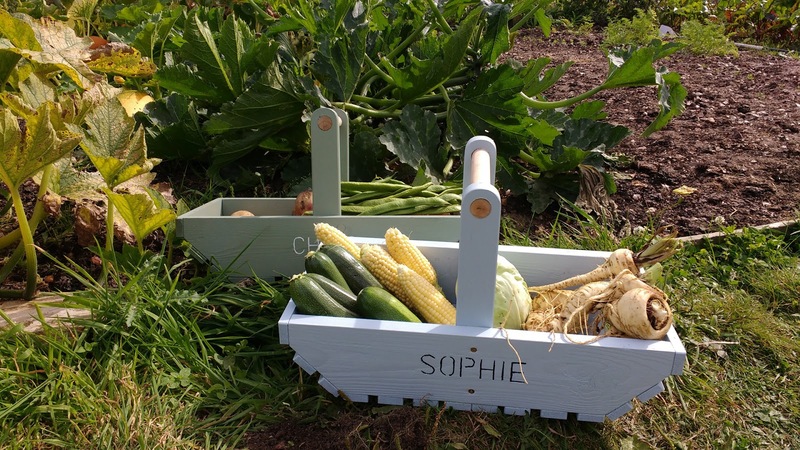 Perfect for taking home our harvest and carrying hand tools as well. Definitely a treat we will be enjoying for a long time to come. 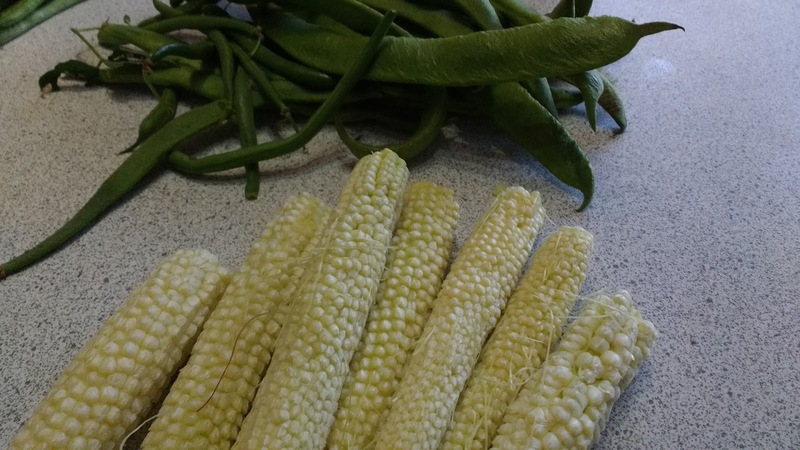 We harvested all of one variety of sweetcorn (which amounted to less than you might imagine) and made a large vat of chicken and sweetcorn soup with it which was delicious. I'm going to hog the remainder which is hiding in the freezer. The babycorn are getting eaten but we'll have to pick the rest soon, along with the rest of the sweetcorn before they get past their best. 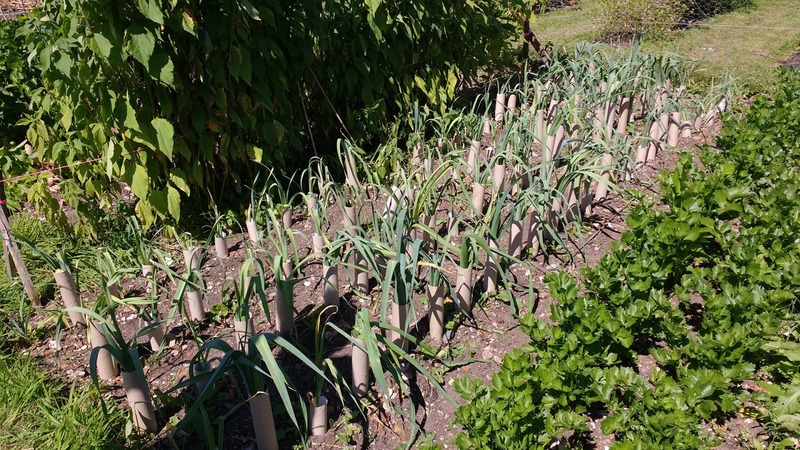 Did I mention that we popped the cardboard rolls over the leeks? I'd been SICK of collecting them for weeks so I'm thrilled that we've used them and I can move on with my life now. Hopefully the leeks will repay my patience. The pumpkins are getting big and ripe (seems far too early???) and the courgettes are insanely prolific. 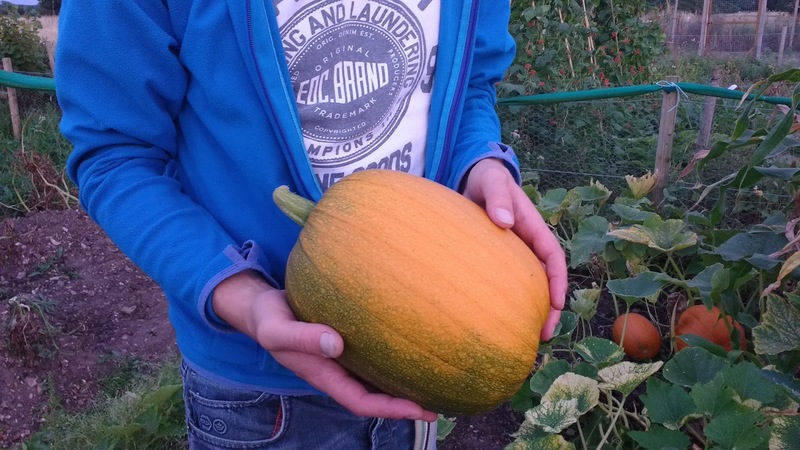 Trust me, if you want a guaranteed crop, go for courgettes. They keep producing! I do have a courgette glut to use up this weekend, so courgette cake and courgette jam/pickle is on the cards. I've got through plenty with just eating it with (many) meals and making courgette fritata - fritters don't work so I just made it in one pan sized piece. We've used about half the potatoes, so that corner looks untidy. The broccoli and cauliflower are done now and we're eating our way through the carrots. 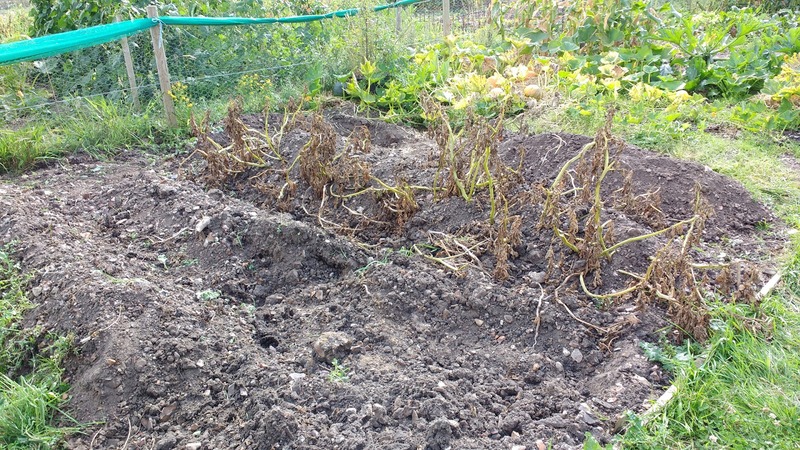 Sadly, the parsnips have suffered with the stoney ground and have twisted and mutated. 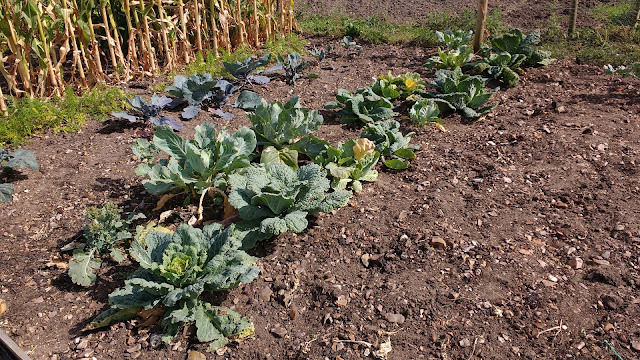 But although the plot is emptying, we have plenty of winter veg to keep growing and also I have plans for growing more flowers on the plot so we will start to prepare the ground for next spring. 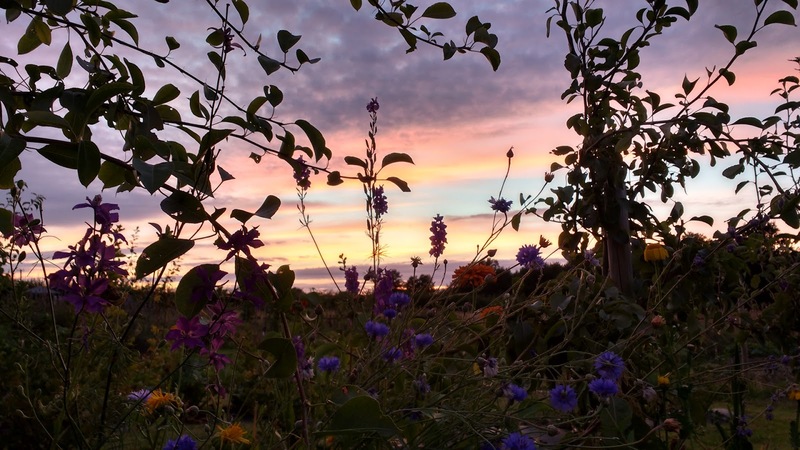 Manuring and rotivating will take a lot of work so there is no shortage of demand on our time. Wow, I am so impressed!!! You've done so well!!! 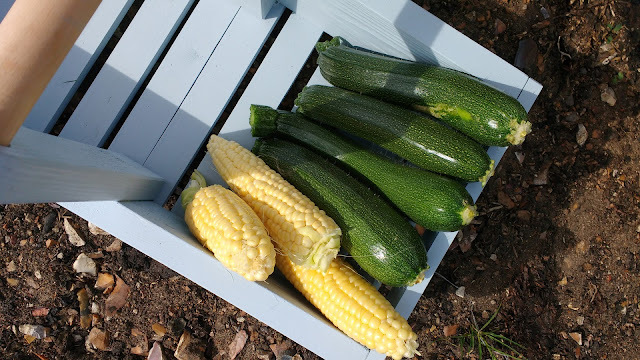 I wish my courgettes were producing! Not one so far!!! Your sky photos are gorgeous Sophie,as are all of them,very interesting post again,very impressed with all your work and the results.I must admit I didn't even know what a trug was,they are lovely and would make a great gift.Thanks again for sharing. So lovely. I would love to have an allotment one day.